A day after the Somali Islamist group al-Shabab killed 36 quarry workers in Kenya's north-eastern region of Mandera, the media is urging the Kenyan government to review its security policies. Two newspapers warn that Kenya faces a "serious Boko-Haram type problem", while another calls for the army's withdrawal from Somalia. The media are still conveying shock and outrage about the killings, with many front pages showing pictures of the dead men laying face down on the ground, and blood pouring from their heads. "Kenya has a serious Boko-Haram type problem in the making," says an editorial in the top-selling, influential Daily Nation. It suggests that the Kenyan government has fundamentally misunderstood today's al-Shabab, arguing that "the presumption that this is a foreign invading force is no longer sustainable. Al-Shabab has morphed into a local, jihadist insurrection led principally by Kenyans born and bred in the places now under attack". Over the past months, many Kenyans have demanded that the country withdraw its troops from Somalia. 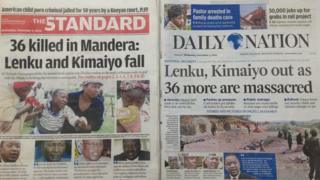 Some Kenyan papers agree. Al-Shabab has repeatedly said that Kenya's involvement in Somalia is the main reason for its attacks. The Star newspaper, which often takes a bold editorial stand, suggests that the army should be redeployed throughout north-eastern Kenya to secure the border. "Security and intelligence systems must be restored to functional and efficient levels before the country slides into a Nigeria Boko-Haram-like mess," the paper says. Many of the papers' headlines suggest that there is support for President Uhuru Kenyatta's move to replace the police chief David Kimaiyo and Interior Minister Joseph Ole Lenku. The Daily Nation says they "were sustained in office mainly by President Kenyatta's pride; his determination not to be seen to submit to public criticism". However, the paper slams the opposition Orange Democratic Movement of former Prime Minister Raila Odinga for calling for Mr Kenyatta's resignation. The daily sees this as exploiting "a moment of grave national danger to demand the resignation of a rival: To play politics with national security is not responsible conduct for a leader". The paper believes that Kenya needs the contribution of a wide cross-section of leaders, including community elders and religious leaders, to defeat al-Shabab. "One or two minds cannot run a country," it says. Widely-read daily The Standard, which is often critical of the government, also calls for unity: "Cord and Jubilee [political party] leaders must abandon the little differences that distract them and make it look as if insurgents have free run of the country". Other papers warn of dire economic consequences to the growing insecurity. "Businesses, especially in the tourism sector, are suffering and we must not allow multi-billion shilling investments to go to waste simply because we cannot get our act right in improving security," the Business Daily says. Commentator Jaindi Kisero, writing in the Daily Nation, urges Kenya's leadership "to engage in national introspection. If we do not restore peace in northern Kenya quickly, then all those clever economic blueprints we have been churning out will be worthless".